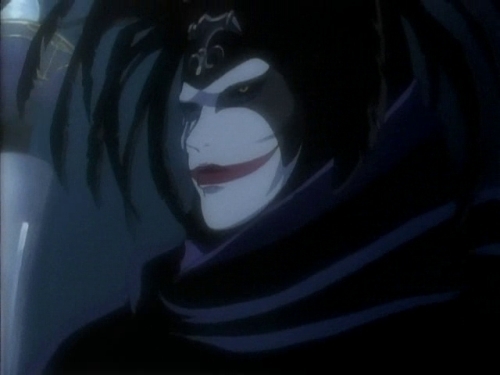 I first watched Wolf’s Rain in 2003, just as I was beginning to ramp up my interest in anime. I remember a few things about it: being absolutely traumatised by its ending and being spell-bound by Yoko Kanno’s music. Following on from the similarly fondly remembered RahXephon, it made a fan of Studio Bones out of me, too. 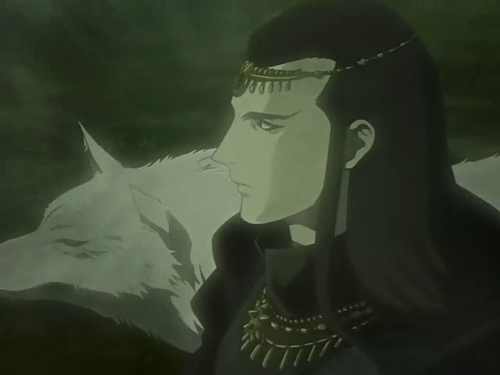 Which is to say, Wolf’s Rain became one of my favourites and just last week, nearly 10 years on(! ), I finally re-watched it. Two circles because it feels like in both there’s two stories working in parallel, independently of each other. In Darker than Black, there’s the syndicate controlling Hei’s movements and all the intrigue surrounding Hell’s and Heaven’s Gates, whilst in Wolf’s Rain, there’s the nobles warring between each other, sweeping up whole countries in their wake. If what I’ve just described can be pointed to as the Outer Circles of Darker than Black and Wolf’s Rain, then the Inner Circles are the ones we directly follow. Hei slowly discovering his purpose in the former and the wolves’ search for paradise in the latter. Sometimes the circles’ converge, but I like the way Okamura seems to write as much for events off the screen as on it, his anime are different in that way, more alive. The world is being torn apart in Wolf’s Rain, whole cities fallen by the way-side, and no-one seems to be asking “why?” I prefer it that way, though. I’d rather use my imagination to fill the gaps, which is to say, I don’t think it’s a fault of the writing if a fantasy series fails to explain certain mysterious things. 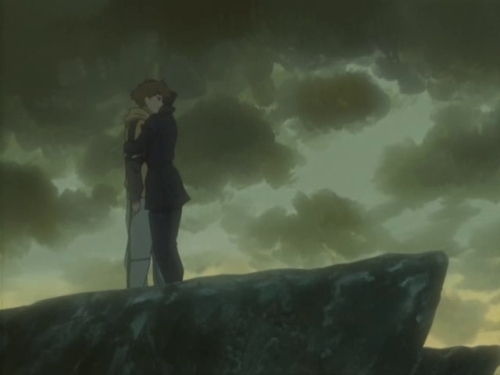 Wolf’s Rain isn’t completely abstract, though. Well, the idea of paradise may be abstract, but their journey is one of companionship and sacrifice. My favourite scene in the whole series comes during the latter half of episode 26. Darcia has broken free of Jagara’s false paradise, but is stabbed by her. Just as she’s about to deal him the final blow, Hige flies-in in his wolf form to attack her. He manages two rushes before she throws her sword at him like a javelin, impaling him through the side. It’s hard to describe it here because my memory of the scene is so intertwined with Yoko Kanno’s beautiful music. It’s such a shame that the specific track used in this scene was never released, but anyway, the music rises as Kiba appears, there to finish off Jagara and save his friends. Tsume and Toboe pull the sword from Hige and, despite his injury, he jumps straight back in after Jagara, desperate to prove his worth. I’ve already mentioned Yoko Kanno a few times in this post, but one really can’t underplay how vital her music is to the series. This is her at the very top of her form, such a wonderful collection of acoustic, soft and swirling orchestral pieces so tightly woven into my recollection of the series that I’ve basically memorised scenes according to what song was playing in the background. One can’t underplay Studio Bones’ work, either. I’m an animal lover anyway, but the way they’ve animated the wolves, the way they run, snarl and bite, is so affective. Wolves are strong, wild animals, yet Bones are able to conjure a sense of poetry and magic around them, as well as a painful sense of vulnerability. 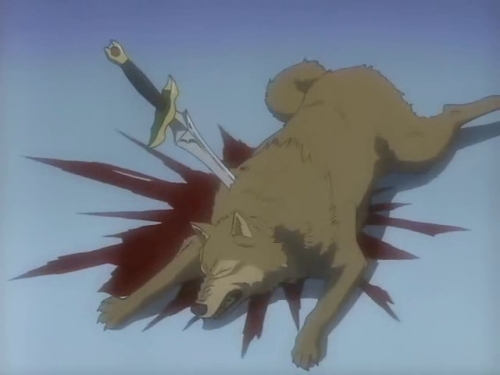 Humanity in Wolf’s Rain is rotten to the core, but the wolves are so idealistic and honest that to see them beaten down is almost too much to bare. Which is all to say, Wolf’s Rain holds up well. It’s also the last TV series written by Keiko Nobumoto. She wrote Cowboy Bebop and Macross Plus, and, in a sense, this is a fading echo of that era. Along with Shinichiro Watanabe, she’s quietly disappeared, but I’d love to see them working together again. I miss anime like this. As for why the world is falling apart and Paradise and such, I had a pretty extensive theory (I don’t remember most of it, though – maybe if I rewatch it! ), but I’m actually still pretty impressed how they managed to just make the world work with just a few hints and a mythology (that turned out to be true). I wonder what happened to Nobumoto Keiko. Wikipedia has no info whatsoever on what she has been up to since 2003. Too bad, she had such talent. Also! I forgot two things – one, the wolves. They are some of the most accurate animal portrayals I’ve ever seen in animation. Kawamoto wrote somewhere that he spent a lot of time researching wolf anatomy and behavior, and they had a “how to” guide for animators to be sure they don’t mess up. Two, the seiyuu. Kiba is my second favorite Miyano role, right after Ouran High School’s Tamaki. His voice is perfect for the role, and he sounds so pure and earnest. I know there are no “what if”s, but I’m not sure the role would’ve worked as well with a different seiyuu playing Kiba. 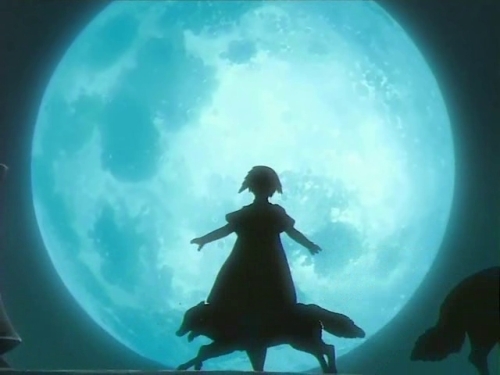 The way they animated the wolves is poetry in motion, I fell straight back in love with the series as soon as I saw them and while I’m sure they weren’t easy to animate, the end result is so lively and full of heart as to move me. Really is some gorgeous art in this series. I would love to read those interviews/articles about the series, btw. I don’t know if the artbook has been released in English – it has a long interview with Kawamoto (not just about Wolf’s Rain), and also commentary on the development of the character designs. The DVDs also have some interviews with the staff… Too bad they never released a guidebook. In one fell swoop you manage to write about two series I was planning on doing write ups about. I’ll just have to see how deep the well of interest in Darker than Black goes. Great to know another Wolf’s Rain fan ^_^ It’s been among my top 5 favorite anime since I first watched it in 2006. I’ve rewatched it many times over the years and love it more each time! You know, despite enjoying Bones, Keiko Nobumto, Tensai Okamura and Yoko Kanno and all that, and despite it playing on Adult Swim about 14 times through back in the day, I have never sat down and watched Wolf’s Rain. Suppose I’m going to have to remedy that eventually. I also get a feeling from it that it’s one of the last vestiges of a certain kind of anime that doesn’t really happen anymore. I really loved Wolf’s rain but the end was just really upsetting. I watched this AMV Lord Darcia II by Akadestu on youtube – and I need to say It was one of the really rare AMV about Wolfs’ rain that wasn’t upsetting – really should watch it!